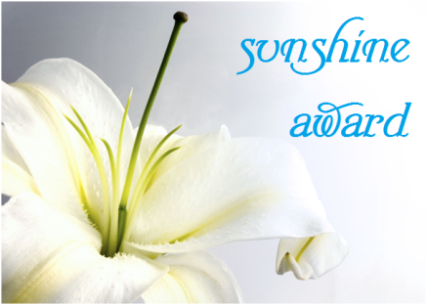 Thank you to Terry @ http://www.terry1954.wordpress.com for nominating me for the Sunshine Award! This award is very special b/c my mom had a friend who passed away with cancer a few years ago who use to call me “Sunshine”. Terry blogs about taking care of her brother who has many health issues. She is a very kind and loving sister who is also pretty tired. You can check out her blog at the link above. She has always been a follower of my blog and has really become a friend over the years… even though I stop writing for months at a time, we always seem to pick up where we left off. http://www.learningtobeblog.wordpress.com This is a great inspirational blog. This is Matt Walsh and I know you’ve read his blog. It’s very honest and very good!! http://www.waitingforbabybird.com Elisha blogs about waiting on God to bless her and her husband with a baby as she believes for a healing in her body. It’s a beautiful blog that will make you wait with anticipation with her! These are the only 3 I’m nominating this time. I hope you enjoy them. Next Am I a “Selfie”?